Blues singer, Ida Lupino, gets a job at Richard Widmark's joint, but ill-advisedly falls for his general manager, Cornel Wilde. Lupino plays the floozy to perfection, her unsmoked cigarettes burning lines in the piano, as she plays and sings her tragic ballads. 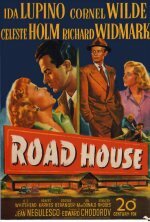 As the rejected lover, Widmark gives one of his trademark psycho performances, framing his employee and then going ballistic at the end, when Lupino and Wilde hide out in a hunting cabin on the Canadian border. Not one of the great film noirs, but still a very gripping movie.